Kolymbari holidays. Visit somewhere different in Crete, Greece. Kolymbari is a large fishing village on the west of Crete situated on the Rodopou peninsula, its sits 23km from the main city of Chania and is easily reachable by a regular local bus, or by hire car. The village of Kolymbari is perfect for a quiet holiday break, you can expect traditional white washed houses with blue doors, covered in all manner of flowers and shrubs and small welcoming hotels. The rugged terrain and quiet beaches make for an amazing holiday break in Crete, the beach of Kolymbari is mix of sandy and shingle gradually sloping into the crystal clear Aegean sea. The village itself has remained largely untouched by mass tourism, and the locals rely on the sea and the land rather than the tourist trade. There are of course a few small Taverna’s and bars to sit and relax the night away, pick the right day and your sure to be roped into a bit of traditional Greek dancing. If you want to explore the area surrounding Kolymbari then best hire out a car which you can pick up at Chania airport and drive up into the Rodopou mountains where you will find tiny little villages and hamlets clinging to the mountains, these villages offer some of the warmest welcomes we have yet to encounter in Crete. The village of Rodopos itself is famous within Greece for producing the finest tasting honey, grab a few jars of this for next to nothing even with the euro as it is now. You can buy locally brewed wines and Raki here also, the villagers claim it to be the finest in all of Crete. The sights you also might want to visit the monastery of Gonia, the monastery itself dates back to the 13th century, and if you arrive within the stated opening hours you can enter the church and admire the frescos and amazing architecture. If you want to have a more active holiday in Kolymbari then why not pack your hiking boots and cameras and head for a day trip to Samaria Gorge. There are a few irregular boat trips around this area, and you can visit the beaches of Kissamos and Balos, both within easy reach of Kolymbari. There are only a few hotels and apartments available in Kolymbari, one of the most popular is the Selini Suites, a lovely 4 star hotel overlooking the village. You can find out more on this hotel by visiting Thomson holidays main website. 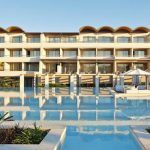 Another popular hotel is the Cavo Spada hotel, a luxury hotel that’s situated right on the beach, with swim up pools and large modern rooms, the hotel never gets busy and its like you have it all to yourself. A holiday in Kolymbari is well worth it if you want to relax and not see another tourist for days. The village is only a short drive to the bustling capital of Chania, so if you get bored or want to go shopping just jump on the local bus or in your hire car. If your looking for total tranquility away from everyone why not try booking a hotel in Veni just 15 minutes drive away.